I thought I’d let you know the sort of things I get up to on a Saturday like today. It’s been a busy day. I started off this morning by chairing an event for residents in Brunswick to come together and discuss the housing challenges we face. Labour’s shadow housing minister John Healey MP kindly came here for the event. It’s so important for people like John, local councillors, and myself to listen to residents and be available to answer questions. The three hour event was a huge success and I’m so grateful to people for taking the time to be there. Then I shot off to welcome a Christian groups from all over Sussex and Kent who’s come together here in Hove for a lunchtime event of food, discussion and worship. And then straight over to Hangleton to spend time at a Ramadan Bazar. It was simply amazing! Arabic speakers from all over the city came together to celebrate and enjoy traditional food from different Arabic countries. It was such a joyous event and I loved meeting so many energised and excited people, especially the kids who had taken so much time to come in traditional dress. Then, via Nando’s, I dropped into an Artist Open House. Each year as part of the Brighton Festival people team up with artists and turn their homes into art galleries. How cool is that? The one I dropped in to had seven artists on display and if I hadn’t left my wallet at home on purpose I’d have been seriously tempted by some of it! The final stop of the day was to an event I so look forward to every year, the St Anne’s Well Gardens Festival. But this year it was slightly different to most….it was sodden! 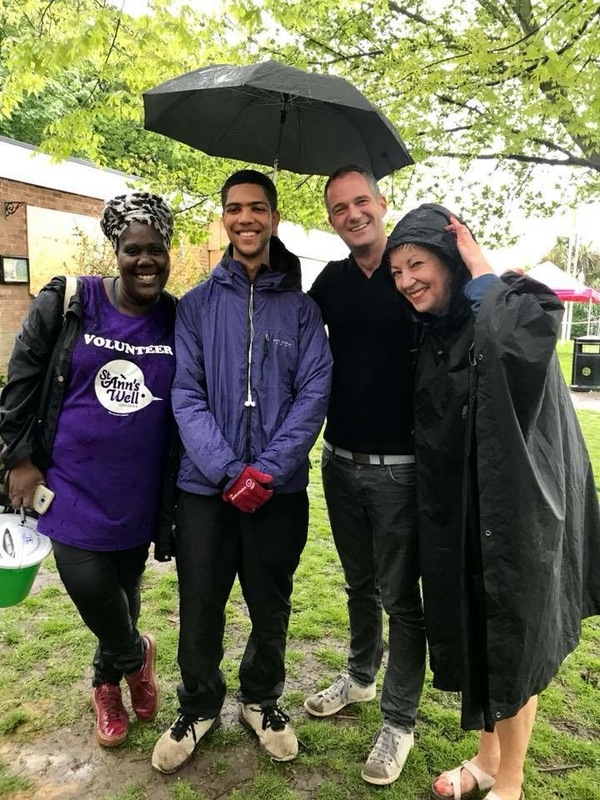 The rain had seriously put a dampener on things so my job was just to say a huge thank you to the soaked volunteers for braving the weather. On the bright side, there wasn’t a queue at the hog roast tent this time!